This from Fender's 1996 collectibles range and is a made in Japan 52 reissue which is the only guitar I have ever bought new. This guitar was made in yamaha's Indonesian factory in 2011 it is ridiculously good quality for the price some specs from a review. 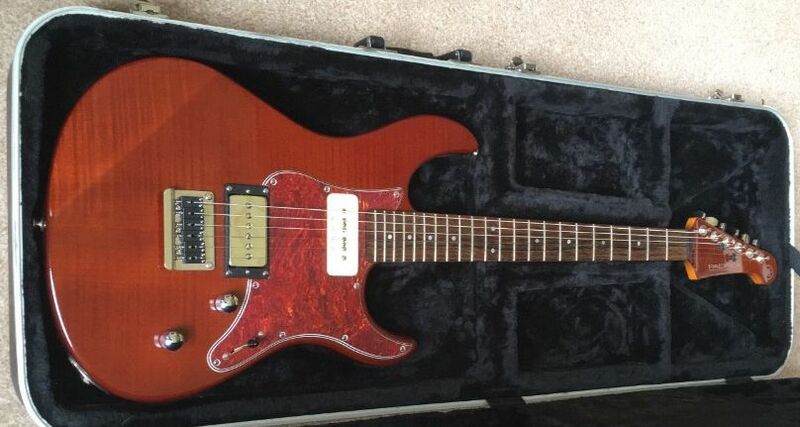 The Yamaha Pacifica 611 has a solid Alder body, a feature often found only on more expensive guitars, and which forms the backbone of Yamaha's quality sound. This is complimented with a selection of quality hardware. First up is Yamaha's original bridge plate/GraphTech string saver saddle. Teflon-impregnated saddles dramatically reduce string breakage while minimizing the dominant 2KHz tonal spike of metal saddles. Combining these saddles with Yamaha's original steel bridgeplate give the perfect combination of quick response and strong sustain. Locking Grover machine heads lock strings automatically for stable tuning and mega fast string changes. The Yamaha Pacifica 611 features a coil tap function which allows simple switching from humbucker to single coil tones from the Seymour Duncan Custom 5 bridge pickup. The Graph Tech nut and string tree TUSQ XL is precision engineered to couple the strings vibrations to the neck and bring out hidden harmonics and richness in every note. 500 times more slippery than graphite, the Teflon-impregnated material eliminates string-binging and ensures tuning stability, even with massive string bends. If there is a better 335 than the Yamaha Superaxe made I have yet to find it and I include the twice the price Gibsons. Again made in Japan this time around 1979 it's unusual in that it's a Les Paul with a bolt on neck so took some time to set up to get the tuning stable but now that it is set up it's among the easiest to play of my guitars. Details of the range here. This is the made in Taiwan version of the Mike Stern signature model beautiful looks and feel and a testament to the quality of Yamaha's Taiwan operation. This is from the first and best range of Superflighters and was made in Japan in 1978 we can get an exact year on this from the pickups. There is a whole web site devoted to these see my links page. Vintage Burns guitars are pretty expensive but Burns of London have been producing some great alternatives since 1992. These guitars are all excellent quality more details on my Burns site see menu above.